Grey green leaves on a well-branched succulent make for a great foliage plant, but this senecio has the added benefit of striking orange late season blooms. Keep it going as a houseplant. Commonly called Orange Flame, Mountain Fire or Blazin’ Glory. 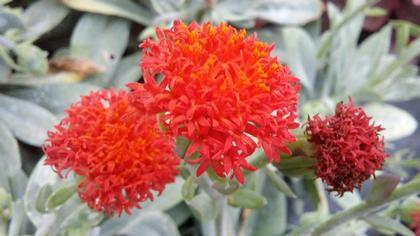 It is a perennial succulent native to South Africa and we sold them in our annual foliage program this year. It grew in a Tera cotta pot to about a foot tall and consisted of very dense thick rubbery blue green foliage. It reminded me of Sigmund and the Sea monsters. It just hung out all summer never bothered by much of anything. It’s watering is minimal or not fussy. In September it began producing flower stems that stayed tight to the plant and the plump flower buds that all nodded down which is to form. I brought it in the house at the end of September to save it from frost and in October the flowers stretched up and out and opened to a brilliant orange, not dissimilar to a dandelion or marigold but a fancier petal form. It’s a keeper!